Last week, CatTime.com reported on Sponge Bob, a 33-pound cat that was dropped off at a New York shelter. One online publication reported on the same feline, calling him the world’s fattest cat. They may not be saying that today. A 10-year-old cat named Garfield arrived at New York Animal Care & Control of NYC last week on May 31 after his owner died. The cat may bear the same moniker as a cartoon cat, but that’s where the similarities end: this feline weighs 40 pounds. The cat was rescued by the North Shore Animal League America in Port Washington, N.Y. Although the cat’s size has given him celebrity-like status in the pet world, experts say there is little to cheer about. No one knows how the cat arrived at its current weight prior to the shelter, but he has been put on a strict diet and an exercise plan to slim down. The cat enters a new foster home tomorrow. Garfield is the latest in a trend of overweight cats arriving at shelters. In April, a 39-pound cat named Meow was surrendered to a shelter in New Mexico. 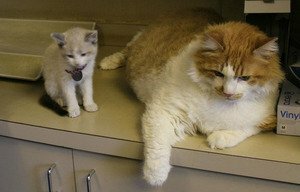 The facility used the feline to highlight pet obesity as a growing problem. Meow died on May 5 of pulmonary failure. Sponge Bob is currently available for adoption at a shelter also located in New York.